For the benefit of those who find it hard to view the maps in the e-book editions of my books, here are the original high res versions. 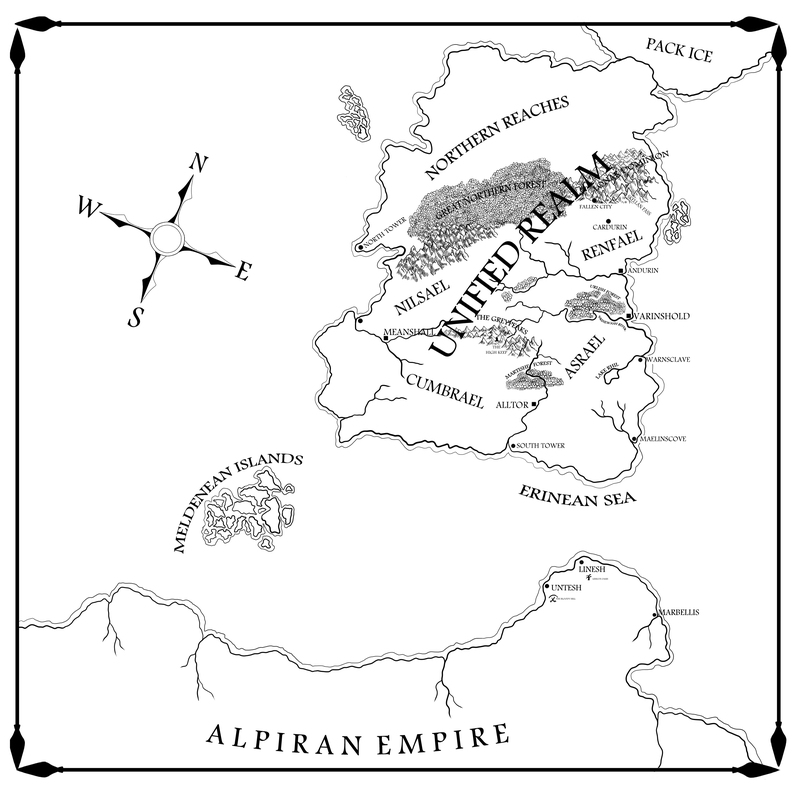 Maps from the Raven’s Shadow Series: Blood Song, Tower Lord and Queen of Fire. Great story! I couldn’t put it down. Looking forward to the next one. Anthony, just wanted to say how excellent blood song is. Just read it in 2 days in between working. 24+ hrs in that period. Truely excellent writting, great characters, pplot, format, belief/magic foundations. Really knocked me off my feet. Mainly a fantasy guy, but am also going to buy slab city blues even tho it appears to be more sci-fi, (not my thing) I like your style dude…. congrats man, pure quality brother. I find it very more than interesting, it was fantastic. The plot, the characters, couldnt put it down. When is the second coming out? keep me posted. Blood Song was easily my favourite book of 2013, (followed by Daylight War) it had everything you want and more from a fantasy novel. The hype was fully justified and if anything it gets better on the second read. I am extremely excited about Tower Lord! I just hope you (Anthony) do a book signing so I can meet you personally. Could you put the Tower Lord maps up here as well? I’m reading the e-book via Adobe Digital Editions and referencing the maps on that is a serious pain. Loving the book so far by the way, you’re one hell of a writer! Thanks for posting the Tower Lord maps so quickly! I just finished listening to the audio version and the maps were nice to have. The book was fantastic!!! Loved the story and read both books in only a few days. While I might have to wait more than a few days for the next book, I know it will be worth the wait. I picked up Blood Song on a whim 2 months back because I was looking for a good fantasy. I couldn’t put it down. I have been telling anyone who will listen that this series is probably the best bit of FICTION writing I have ever read. I am a writer and at NO point during these books have I said “Eh, I would have done that differently,” or “He fell off there” (from an artistic standpoint). I LOVE your world. I LOVE your characters. I LOVE your story. Thanks Nate. Can’t hear that enough. Excellent job on these two books! I stumbled across them by accident and I’m very glad I did. I just finished Tower Lord. It took me about a week to read both books. Curse you for not telling us what happened when Vaelin met the Shield! I can’t wait for the third book and I certainly hope you spend many years feeding the need of fantasy-junkies like myself for many years to come. Mr. Ryan, I felt compelled to leave a word or two on here regarding how much I’ve enjoyed your work. I’m currently listening to, Tower Lord, narrated by the unequivocal Steven Brand, and am simply enthralled. I’ve noticed more than a few negative reviews on the book’s Amazon page, and I was concerned that this would be another case of the sophomore slump. I was completely wrong, and love Tower Lord even more than Blood Song. It is strange to say, coming from a novice and someone with only unsubstantiated dreams of becoming a published author, but I felt that your narrative and writing both matured and flourished with this latest offering. I’m actively shopping hardcovers of both novels, something I haven’t done in a very long time, and eagerly anticipate you making the jump across the pond to my neck of the woods, Texas, to sign then! Ok, I might be a little presumptive with that! Thanks James. Much appreciated. No immediate plans to hop over the pond but you never know. Hi Malcolm, Yes book 3 is complete and with my editor but don’t expect to see it before July 2015. As for the ending, I ain’t sayin’ nuttin’. I’ve just finished listening to Tower Lord and am really looking forward to the next book. I’m 60k words into my first book and am looking at re-planning now (which I needed to do anyway) as I feel like I need to raise my game quite a bit! Thanks for providing a beautifully crafted piece of work. I especially liked the balance between the male and female characters and your ‘reveal’ artistry! And Steven Brand was a great choice for performing the audio version! Are you planning any stand alone novels set in the same world? Or is it a case of ending on a ‘high’ / graceful exit stage left with the third book. A bit cheeky to ask, I know, but it’s worth a try! Keep on inking that magic! Thanks for the kind words. My novella in the upcoming Blackguards anthology will be a stand-alone story in the Raven’s Shadow universe. Other than that, all I can say is I’m thinking about it. Good luck with the writing, remember it’s a marathon not a sprint. I thoroughly enjoyed reading both Blood Song and Tower Lord. What can I say but a sincere thank you for perservering, and a plea for you to keep your editor’s nose to the grindstone. I want to read the third book in July 2015! Thanks Val, much appreciated. Don’t worry, barring an asteroid impact or world-consuming solar flare, Book 3 will be out in July 2015. I loved Blood Song and love Tower Lord so far, but I have a question. On pages 423 and 424, Lyrna and the escapees meet up with the Meldenean pirates. Based on Lyrna’s tranlation, they decide to sail East to the Meldenean Islands. If the slavers left from Varinshold, shouldn’t they be sailing back West to reach the Meldenean Islands? Maybe they are going around the world? Confused about the geography in this section. Love the books! Keep up the awesome work!! Aha, but Belorath was cunningly trying to throw any pursuing Volarians off his tail by briefly sailing in the wrong direction. (Yeah, that sounds convincing). Thanks for this, Joseph. Future editions will benefit from it. Loved both books. Where is the Unified Realm in relation to the Volarian Empire? Anthony, are you a gamer? Your book, Blood Song, has inspired me to create a Burning Wheel campaign set in your world. Love it! I play a fair amount of video games but have never played D&D. Glad you liked the book & good luck with the Burning Wheel campaign, whatever that is. Was one of your first fans when Blood Song came out on Kindle and hawked it to anyone who would listen. Started Tower Lord but will need to reread Blood because I’m feeling a little lost. Is there a map with the whole world to date on it? I like a global perspective and with so many new places introduced, it helps place the puzzle pieces for me if the borders are defined. I know. I’m getting old. Not all your fans are 14 year old boys. Some of us are 50 year old women! Thanks for this site, it’s been a life saver since starting Tower Lord as an eBook! And thanks for the great writing and story. I look forward to reading whatever you put out next. I’m just about done listening to Tower Lord and really enjoying it. I had a few issues with Blood Song. Thought it could have been a bit better but you have nailed it with Tower Lord. I’ve listened to quite a few books this past year, British/European history of the Middle Ages and fiction that seems based on the same period such as the Uhtred of Bebanberg series and Game of Thrones. The lot of women in those times was kind of getting me down so it is refreshing to read Tower Lord with all its strong female characters. Thanks. oh, and I appreciate the maps you posted.